Laura Shigihara, a game designer and the composer of the “Plants vs. Zombies”-music, asked me about the level design process and I want to share this with you. Every puzzle, situation, or experience for Grappling Hook started with a simple separate idea. My first puzzle ideas had been straightforward. I just thought about, how the Grappling Hook could be used. This is interesting for me, because the game mechanics are very different and it is somehow an experiment, where I want to see, if the grappling hook is powerful enough to solve these situations. The “Compactor” level for example, was inspired by Super Mario and Star Wars. All of my favorite ideas for puzzles were born during playing. I love to watch how other people play the game. In the first month, almost every tester played the game different. Even later some testers explored new ways, how to use the Grappling Hook. It also happened more than a few times, that I explored a new move/trick just by chance. The strong use of air-control to jump around corners, accelerating with the hook just by clicking for half a second, or “bouncing” off walls are some of those tricks. This was always most exiting, because the game was already able to perform these tricks, but I didn’t know it was possible. The exploration of these new possibilities and later creating quests, that required the “new” features to solve the quest, was really a lot of fun. For most puzzles I’ve created a simple sketch. Everything blue is level architecture. Red marks surfaces, where you can use the hook. Green is the path of the player or how he has to use the hook. Z is the target ( German: Ziel ). At this time no dynamic level elements were planned and I have not even thought about a concept for the level-editor. I’ve used the Half Life 2 engine to prototype the game idea and all level ideas I had in the first two weeks. Modding a finished game, that shares the core game-mechanics with your game-idea, is the best way to prototype a game and I can recommend it to everyone. You are not only able to present a playable version of the game-idea withing 3 to 14 days, but you will also learn a lot, how to do things right, by learning from the pros. Prototyping the game-idea for two weeks was one of the best decisions I made during development. 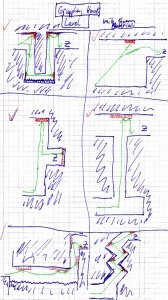 Sometimes I skipped the sketch and tried the puzzles out in the real game, because it is so easy with the Level-Editor. 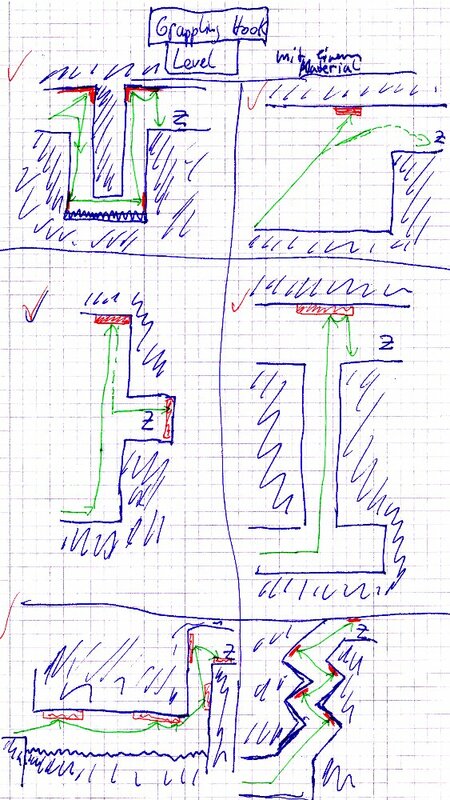 Later in development, when the Level-Editor was full functional, I’ve used the sketches only as a reminder. Planing a level for Grappling Hook generally doesn’t take much time, because I just select a number of puzzles, that fit together regarding difficulty and offer enough variety. Decisions like, where the level starts, where a level ends, and the order of the puzzles are always done on the fly. The basic version of a puzzle is not animated in most cases, because it is faster and easier to try things out with solid cubes. But this first draft is never perfect. Distances may not be right, it is to hard/easy/impossible, or to hard to understand. I do this for around 20 to 50 times for every puzzle and level, before anyone else sees it. The good thing is, that one iteration takes in most cases only around 1 to 5 minutes. Sometimes, when I drop an entire puzzle, change the order of the puzzles, or recreate the whole level, it takes longer. I also play every level at least again 5 to 10 times, because I have to set the challenges. This is most important to improve the guiding, because as a designer you see the level totally different. You know exactly, where you are, how the level is constructed, and how you can solve the puzzles. Orientation is a lot harder for a player, especially in the first levels, where players will learn a lot how to use, move, and orientate in the game. Almost every level has blind spots, where 90 % of all players will never look at. When you place something important, like a ledge or key-item at this spot, they players will not be able to finish the level and quit the game frustrated. I’ve changed the start of level 2 more than 6 times after play-tests, because players did not see how to get up to the first checkpoint. I first tried visual hints, but that did not work, because the players focused on the checkpoint and did not turn around. Without a lot of testing with other players, I would never have been able to find and fix this serious level design flaw. Of course, I try to add color-hints and arrows during step 5, but there is always room for improvement. I’ve done around 2-3 play-tests every months with different players and this is probably the most important step during the entire game development process. Play-tests are not only the greatest source of motivation, they are also the only way to ensure, that a game is fun and intuitive. Of course, they also reveal technical bugs. As a developer you always have some skeletons in your closet, bugs you know about, but don’t want to fix, because you are lazy. You will avoid these bugs, while you play the game and will almost forget that they even exist. But testers will bring them back to the surface. And when someone else points at a bug, it is a lot harder to ignore it. I would love to hear your option about the work-flow. When you like the levels, you know now, that all the great testers who supported me, made a big impact on the overall quality of the game. Do you have suggestions how to improve the work-flow? What do you do different, when you design levels and puzzles?